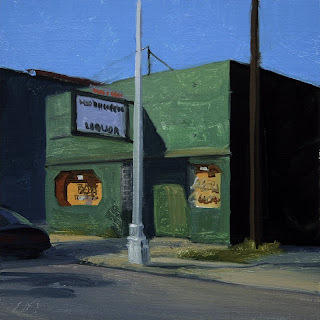 Hoot Robinson's, oil on linen panel, 5"x5"
Many Tiger fans started and or ended their game day at this Detroit institution across the street from the stadium. 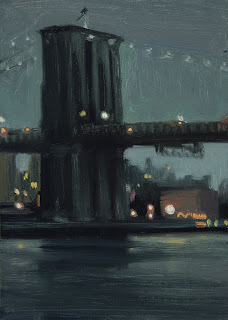 Rouge Nocturne, oil on linen panel, 5"x7"
Brooklyn Bridge#5, oil on linen panel, 7"x5"
Brooklyn Bridge nocturne. 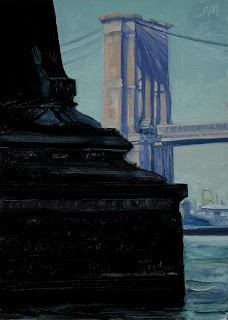 The fifh in a series of paintings in celebration of the Brooklyn Bridge's 125th Anniversary. 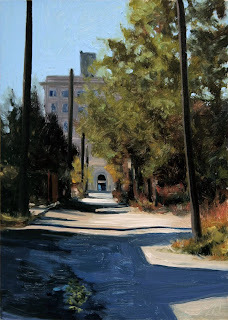 This is a commission I just finished for a Fantastic Client. 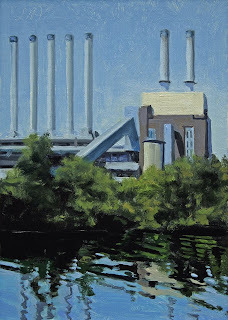 Seven Sisters, oil on linen panel, 7"x5"
This powerplant know asThe Seven Sisters was a landmark on the Eastside of Detroit, it is no longer standing. 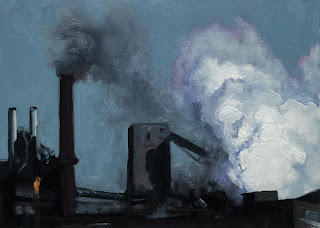 There were seven stacks on the left side the two on the right. 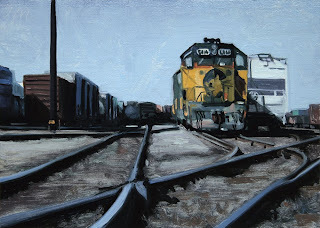 They were know as the Two Brothers. 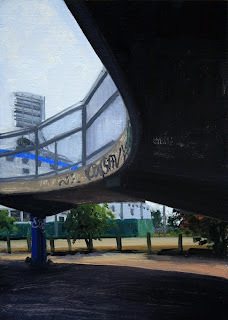 Tiger Stadium #2, oil on linen panel, 7"x5"
This view of the stadium is from under the pedestrian walkway. 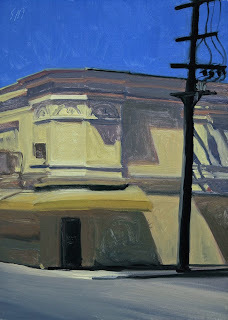 And shows the green fence around the demolition. 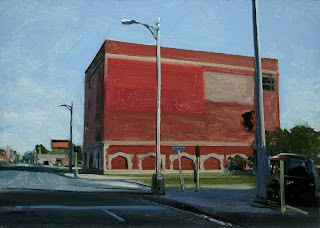 Big Red, oil on linen panel, 7"x5"
Sometimes you have to be able to find the beauty of a scene. 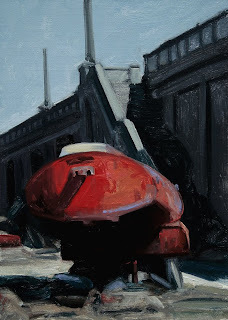 The rich red of this tanker set against the cool dark shadows really caught my eye. How can you resist. 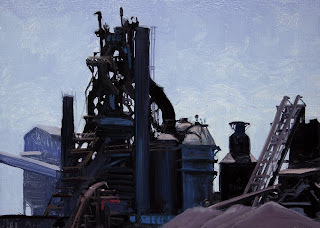 Rouge Steel Blue, oil on linen panel, 5"x5"
An atmospheric view of the Rouge Steel Blast Furnaces. 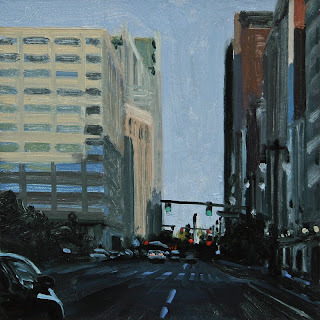 Woodward Ave, oil on linen panel, 5"x5"
Along Woodward Ave looking toward the river. 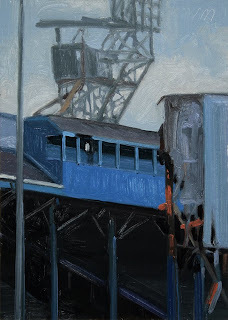 Tiger Stadium, oil on linen panel, 7"x5"
They have finally started the demolition of the Old Tiger Stadium. 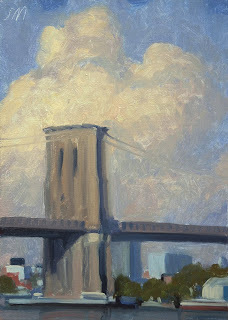 Brooklyn Bridge #4, oil on linen panel, 7"x5"
Brooklyn Bridge and clouds in afternoon sun. 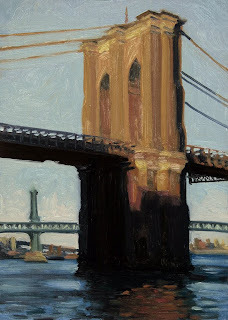 The fourth in a series of paintings in celebration of the Brooklyn Bridge's 125th Anniversary. 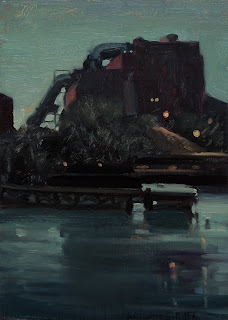 Evening Shadows, oil on linen panel, 7"x5"
I have been taking photos of the demolition of the old Detroit Tigers Stadium for reference to do some paintings and this little scene was across the street. 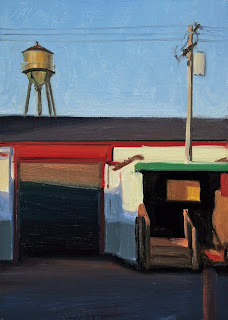 How can you resist the chance to paint all the primary colors in one painting. 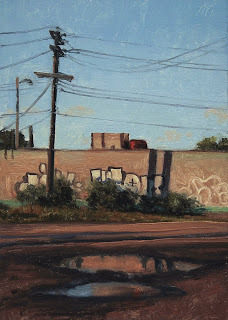 Wall Reflections, oil on linen panel, 7"x5"
I have been taking photos of the demolition of the old Detroit Tigers Stadium for reference to do some paintings and this little gem was across the street. 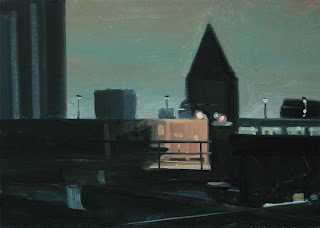 Detroit Nocturne #3, oil on linen panel, 7"x5"
Detroit Nocturne #2, oil on linen panel, 7"x5"
Second in the Detroit Nocturne Series. 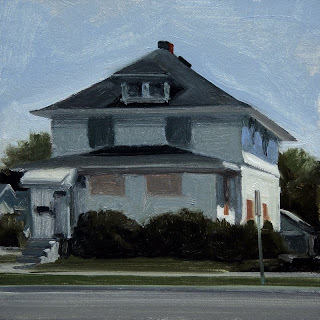 Main Street, oil on linen panel, 5"x7"
A beautiful home on Main Street. A sign of our times. 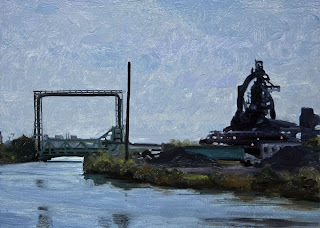 Rouge Bridge #2, oil on linen panel, 5"x7"
Part of the vast River Rouge Industrial complex. 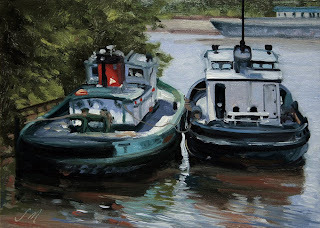 Zug Island Landscape, oil on linen panel, 5"x7"
Brooklyn Bridge #3, oil on linen panel, 5"x7"
Woodward Shadows, oil on linen panel, 5"x7"
Late afternoon shadows along Woodward Ave.
River Rouge Tugs, oil on linen panel, 5"x7"
Tug boats along the Rouge River. 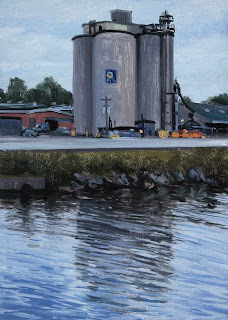 Rouge Reflections #3, oil on linen panel, 7"x5"
The Morton Salt silos along the Rouge River. 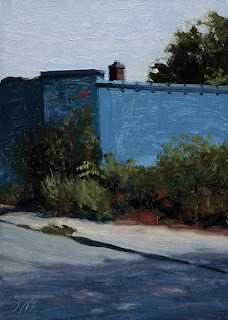 Downriver Shadows, oil on linen panel, 7"x5"
A beautiful clear summer day. 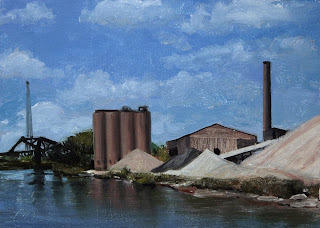 This is a view of the downriver industrial area of Detroit. 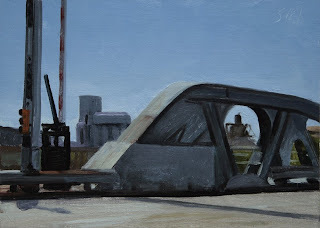 The Yellow Awning, oil on linen panel, 7"x5"
Westside Blues, oil on linen panel, 7"x5"
Brush Park Shadows, oil on linen panel, 7"x5"
Brooklyn Bridge #2, oil on linen panel, 7"x5"
In celebration of the Brooklyn Bridge's 125th Anniversary, I will be doing a series of Brooklyn Bridge paintings this summer. 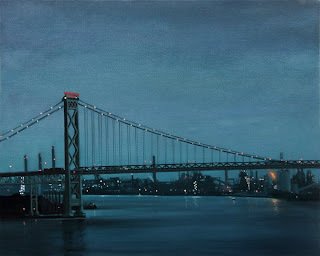 This view has the Manhattan Bridge in the foreground. 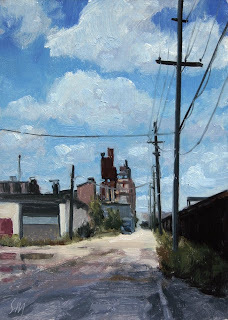 Rouge Tracks, oil on linen panel, 5"x7"
River Rouge Industrial landscape showing the rail yard. 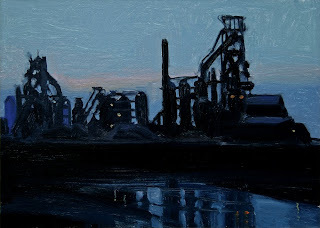 Rouge Steel, oil on linen panel, 5"x7"
Rouge Reflections#2, oil on linen panel, 5"x7"